I couldn't wait to try another brocade style manicure with metallic pink and some filigree. 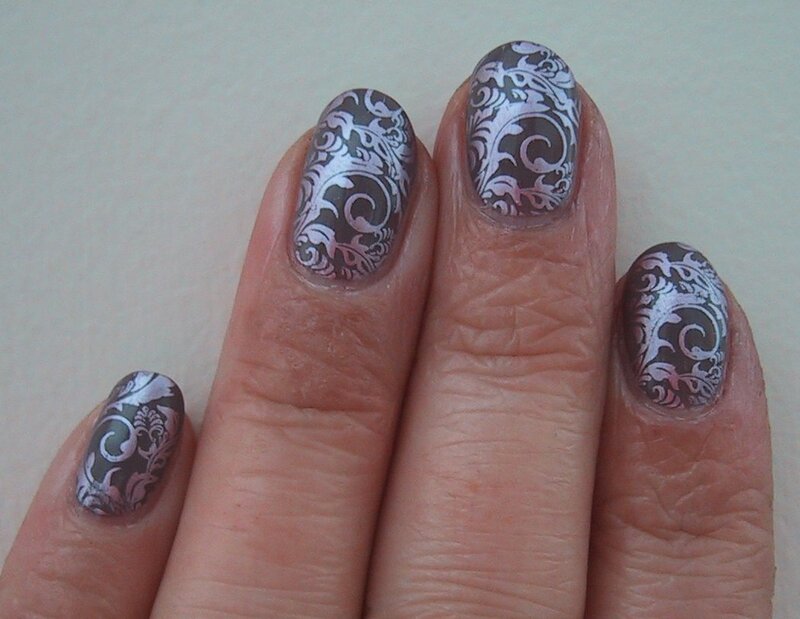 I used 2 coats of Sally Hansen Complete Salon Manicure Commander in Chic, and then stamped using GOSH Metallic Pink and the filigree image on BM21. Seche Vite top coat and voila! Honestly my cuticles don't look that scary in RL. Yay macro! The colour is off in all of these shots. 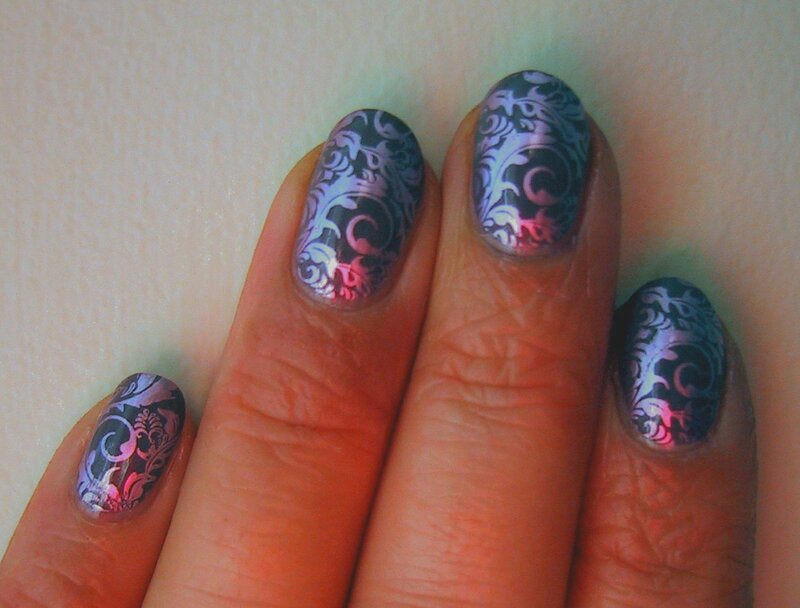 I couldn't capture how ridiculously pretty/purple/pink this mani is. This next one just looks grey and silver on my laptop. I am super proud of the results, because I was using a BM full nail image and those are too darn small for my nails so I had to double stamp every nail but my pinkies. It's pretty much seamless! Woohoo! I don't know why my camera decided to go all artsy with this shot. Must have been because I opened up the blind to the left and the light was just so. I included it because it's rad. it makes me wish I had some super fine holo polish to use for stamping. OMGosh I love this! I tried to use that same design last night but it didn't look anywhere close to this. Definitely a win! You did really good in the double stamping. So pretty. Oh my, this is beautiful! I have got to get me some BM plates! alikat: Ohmygoodness it was difficult to get them lined up, especially with my right hand, but with my tongue stuck to my ear I got the job done. Anita! There are lots of neat ones in the BM set. My biggest irritation is that the full plates are so small. And if they need to keep them that small I wish they were designed to repeat. Michelle: Indeed they are! I am SO glad I picked them up when I did. I can't find them in any of the local Drug Marts anymore! I found a bit of overflow happens when I go to pick the GOSH metallic up on the stamper, but if I count to 3 or 4 before I pick it up I get less polish squishing out from the etched areas of the stamp. Beautiful mani! Awesome combination of polishes! I love this! You have got to teach me how to stamp so seamlessly bc all but my pinky nails are too big! Maybe you'll try some two-color blended stamping next time? The last photo makes me think that might look awesome! Absolutely brilliant! I thought it was the transfer foil I always use! Great job! 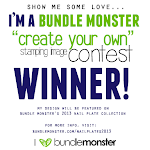 You give me encouragement to try, try yet again with the stamping plates . . . 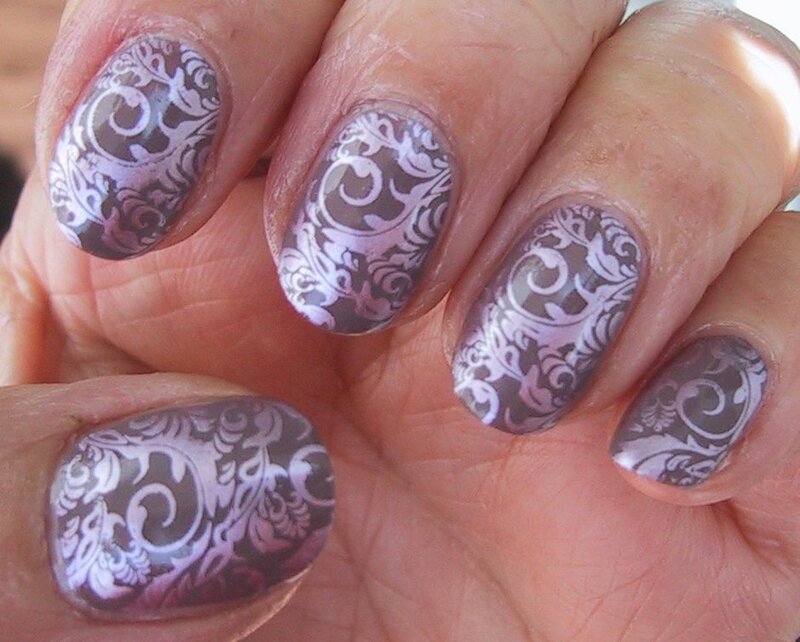 I find it hard to get a complete transfer of the stamp no matter whose plates I am using, and I get so frustrated with it most times I go with another mani design instead . . . so I am gonna challenge myself to perfect that technique as well . . .